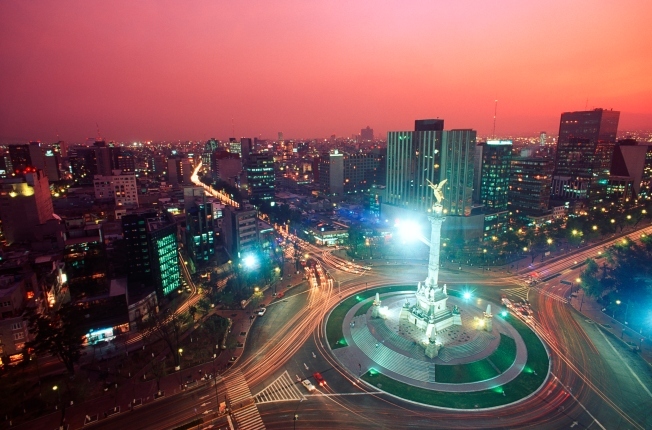 Kidnapping has become a rising problem in Mexico City, seen here at dusk. MEXICO CITY — A U.S. anti-kidnapping expert was abducted by gunmen in northern Mexico last week, a sign of just how bold this nation's kidnapping gangs have become. U.S. security consultant Felix Batista — who claims to have helped resolve nearly 100 kidnap and ransom cases — was in Saltillo in Coahuila state to offer advice on how to confront abductions for ransom when he himself was seized, local authorities said. Unknown assailants grabbed him on Dec. 10, said Charlie LeBlanc, the president of the Houston, Texas-based security firm ASI Global LLC., where Batista is a consultant. "We have notified the FBI and Mexican authorities, and they are working on the case," LeBlanc said Monday. "What we are doing is we're offering our support to the family and hoping for the best." The U.S. Embassy in Mexico City said it would not comment on the case, and LeBlanc declined to say whether a ransom demand had been received. LeBlanc said Batista had his own security business and that "he was in Mexico for business that wasn't associated with our company." "Part of that could be or may involve negotiations with kidnappers," Leblanc said. ASI Global's Web site advertises "kidnap and ransom response" and says the company has worked for major insurance companies. A woman who answered a phone number listed under Batista's name in Miami, Fla.. said she did not wish to comment on the case. Batista was frequently cited as an anti-kidnapping expert at conferences and in the press. A story in the December issue of the trade magazine Security Management describes how Batista organized relatives' response to a kidnapping in Mexico, even cooking the family meals at times. He advised the family during months-long negotiations that eventually reduced the ransom request to about a third of the original amount the kidnappers had demanded. The victim was eventually released. Local media reported that Batista was 55 years old, but his age was not included on his professional profile. Kidnapping has become a rising problem in Mexico, but attacks on U.S. anti-crime consultants have largely been the stuff of movies. The seizure seems to echo the plot of a 2004 movie, "Man on Fire," in which Denzel Washington played a U.S. security consultant who takes on Mexican kidnappers and is abducted himself. A series of high-profile kidnappings in which the victims were later found dead has sparked outrage in Mexico. In the past year, the bodies of the daughter of Mexico's former sports commissioner and the son of a prominent businessman have been found. Non-governmental groups claim Mexico has one of the world's highest kidnapping rates, surpassing Colombia. Earlier this year, more than 100,000 people marched through Mexico City to protest rising crime. Many people carried pictures of kidnapped relatives. Coahuila's governor set off a nationwide controversy by proposing to reinstate the death penalty for kidnappers who kill their victims. Coahuila state law enforcement officials who were not authorized to be quoted by name said Batista had been giving talks to local police officials and businessmen on how to prevent or avoid kidnappings. They said he apparently was snatched from a street outside a restaurant. A profile of Batista posted — and later removed — from the ASI Global Web site described him as "the primary case officer for all cases throughout the Latin American region." The site said Batista was a former U.S. Army major who is "known for conducting in-depth threat assessments, the successful resolution of nearly 100 kidnap and ransom cases (many on behalf of major insurance carriers) and investigations." The company denied local media reports that Batista was a former FBI agent, and warned those reports could put his life at risk.